This print will be limited to 250 hand signed and numbered editions, 18" x 24" (or 46 x 61 cms) in size and will sell for $40 each. It will only be available for sale directly from me in the Art Show, hosted by ACME Archives, in the Celebration Experience Exhibit Hall at Star Wars Celebration V in Orlando, Florida from August 12th - 15th. I am currently taking a list of reserve requests for prints prior to the show for pick up on AUGUST 12th-15th ONLY if you email me directly at joe@joecorroney.com or through my Facebook fan page and type CELEBRATION V PRINT in the subject line. I will be taking reserve requests up until midnight on August 9th and I will only be accepting payment at the show. The artwork *will* be available ALL FOUR DAYS for sale to all fans and everyone that attends the event and there will be *no limit* to how many copies you can purchase in person until the limited edition print is sold out. This reserve inquiry list is meant for serious and interested fans and collectors ONLY (or their chosen representative) intent on purchasing the print from me on site August 12th-15th at the show. The print will be held for you for pick up until the end of show time on August 15th. Due to Lucasfilm contract rules and regulations I can only sell this limited edition print artwork at Celebration V. There are no exceptions. 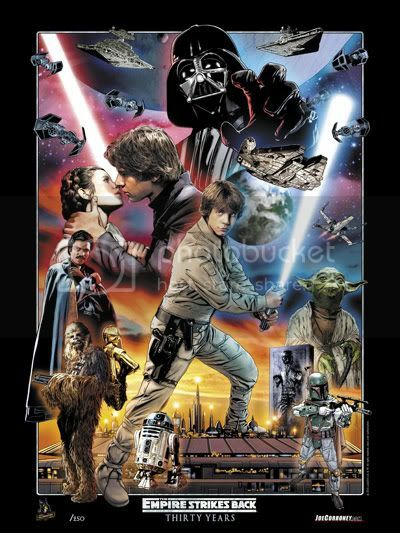 For those of you who own my previous Celebration IV Star Wars 30th Anniversary limited edition print artwork this is your chance to own the new companion piece as another rare and highly collectible piece of Star Wars art history. At Celebration V I will also be signing my art, sketching for fans on-site and selling my original art from Star Wars Insider, The Star Wars Role-Playing Game, Hasbro, unpublished Star Wars art, sketch cards, Star Wars trading cards, Star Wars Empire and my other comic book artwork as well. I hope everyone enjoys the artwork. I'm really looking forward to the show. Thanks for the support and I hope to see you in Orlando this August to celebrate the biggest Star Wars event ever and the 30th Anniversary celebration of The Empire Strikes Back!